• High power output for medium and large size step motors Interested in this drive? Class I hazardous locations are those in which flammable gases, vapors or liquids are, or may be, present in the air in quantities sufficient to produce explosive or ignitable mixtures. Zone 2, also known as Division 2, defines a hazardous location in which flammable gases, vapors or liquids are not likely to occur in normal operation but, if they do occur, will only persist for a short period of time. 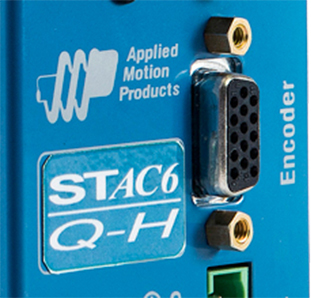 The STAC6-Q-H stepper drive is certified for Class I, Zone 2 locations (also known as Class I, Division 2 locations). Explosive atmospheres are commonly found in the oil, gas, mining and printing industries, as well as in paint-finishing locations and aircraft hangars. Stepper drives from Applied Motion Products are the best in the business. The STAC6 offers best-in-class anti-resonance that ensures optimal performance of the step motor over the widest speed range. 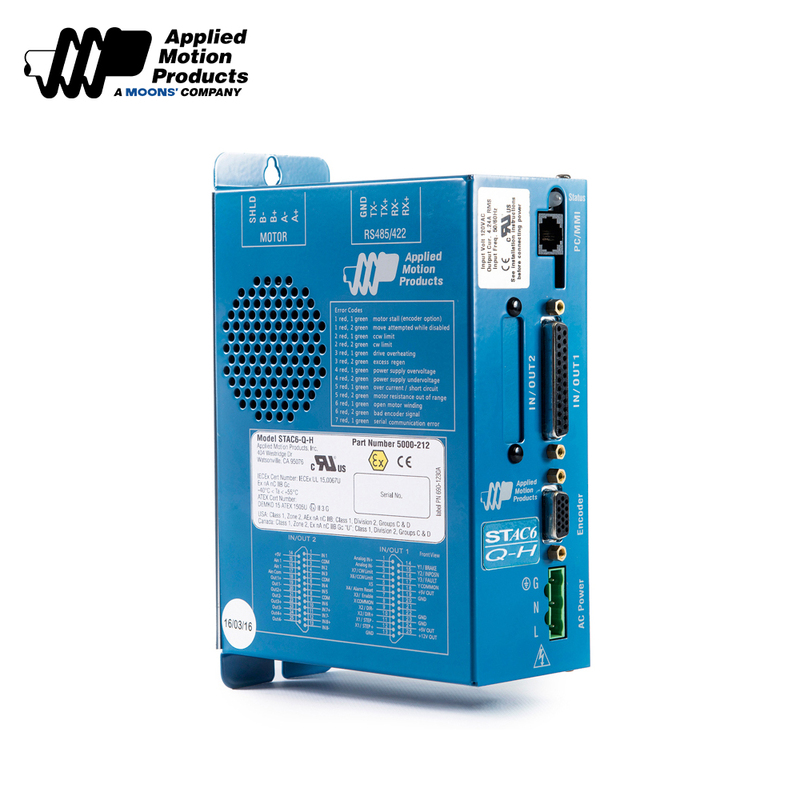 The drive is powered by single-phase 120 VAC which generates a nominal 160 volt DC internal bus voltage capable of driving the highest torque NEMA 34 and 42 frame step motors on the market. 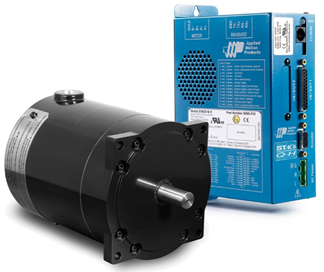 The HX56-100 stepper motor is specifically designed to be used with the STAC6-Q-H stepper drive, the first ever step motor drive that is internationally certified for use in hazardous locations. The STAC6-Q-H features an advanced anti-resonance algorithm that ensures optimal torque performance from the HX56-100 over a wide speed range. Microstepping ensures smooth, high resolution positioning. Class I hazardous locations are those in which flammable gases, vapors or liquids are, or may be, present in the air in quantities sufficient to produce explosive or ignitable mixtures. Zone 1, also known as Division 1, defines a hazardous location in which flammable gases, vapors or liquids exist all of the time or some of the time under normal operating conditions. The HX56-100 stepper motor is certified for Class I, Zone 1 locations (also known as Class I, Division 1 locations). Explosive atmospheres are commonly found in the oil, gas, mining and printing industries, as well as in paint-finishing locations and aircraft hangars. In order to ensure we provide you with the most accurate quote, please submit as much information as you can regarding your application. We will review the information submitted and get back to you with a quote as soon as possible. Ex. Addition quantities, modifications, or general questions. Please describe your application so we can ensure the best possible solution. What are the biggest concerns or constrains within your intended application? Join MOONS' Motion Control fans and stay on top of the latest developments in Motion Control. Our list is geared towards Engineers who like to learn. You'll receive relevant Whitepapers, Articles, eBooks, Guides, etc. We promise that we wont't sell your information or SPAM your inbox with useless stuff. Ever.